“Pennsylvania has a long history of innovation and rebuilding in manufacturing. A lasting economic recovery will rely on an evolving and revitalized manufacturing sector. Workers must be able to acquire the skills necessary to advance in their jobs, find new jobs and meet the needs of employers. “The Senate should move quickly to debate and pass an extension of the Workforce Investment Act to make job training programs more efficient across the country. Let's get rid of the programs that don't work or are duplicative and put our resources behind proven efforts that build skills and lead to jobs. We must train workers with the skills that are in greatest demand and concentrate on the sectors where growth prospects are strongest. That was how Melanie Meyer, of Howell and Company, Inc., Saint Marys, summed up the findings of the firm’s audit of Port Allegany Borough’s 2010 financial accounting. She presented the audit report at the Port Allegany Borough Council’s regular monthly meeting Monday night. There was some good-natured “questioning,” launched by borough manager Richard Kallenborn’s questions of Meyer, including a straight-faced query as to whether he had “absconded” any funds—later repeated., also, council member Lynn Farber probed for a summary. “You are stable,” Meyer replied. Borough council authorized Kallenborn to arrange for purchase of a new leaf machine, for the state bid price of $22,500. The replacement machine will be the same model as the one which has served the borough for a number of years. The funds will be taken from a reserve account used for equipment or vehicle replacement. The current machine will be offered for sale by public bid. Kallenborn announced that water lines will be flushed section by section in the next couple of weeks. Some accumulated sediment will be noticed in the water, he said, and water pressure may be low, temporarily. The “cloudiness” in the water is harmless.. The state Department of Environmental Protection (DEP) recommends the flushing. Also, DEP now requires four log reports on the water system each year. Compliance will be “quite expensive,” according to Kallenborn. The manager said that there had been no bypasses of the sewage treatment plant, even during the recent heavy rains. This indicates a major overall improvement in the sewer collector system and successful exclusion of stormwater and gray water from the sewers. For many years there had been periodic incidents in which hydraulic loads had exceeded the treatment plant’s capacity, causing the excess to bypass the plant and flow, untreated, into the Allegheny River. The borough was fined for each such occurrence. The borough’s application for H2O Program funding for additional sewer line improvements has been rejected, but it will be resubmitted in hopes of securing funding next year, Kallenborn reported. There is concern about erosion of the north wall of the existing flood protection dike, in the area where the dike was breached during 1972 Hurricane Agnes flooding, according to another update by Kallenborn. “We are waiting for Governor Corbett’s decision on releasing the budget funds for the new dike construction,” Kallenborn told council members. “If we get a new dike, that would be a no brainer. But they are making us jump through a lot of hoops.” This means that the existing dike must be kept in service. The McKean County Conservation District and the state Department of Waterways engineers have been consulted on the need and design for at least temporary reinforcement in the damaged area. Kallenborn said that several property owners have been laggardly in installing new sewer hook-on systems following the sewer line upgrades in their neighborhoods. They are required by law to do so. One such sewer customer has been taken to court for enforcement of the ordinance. Court and legal costs were as much as the cost of putting in the hookup, Kallenborn remarked, and the customer will have the expense of completing the hookup as well. “We have sent letters to those who have not complied,” Kallenborn said. They must carry out the hookup projects or face similar legal action. Farber, who is one of the council’s delegates to the Samuel W. Smith Memorial Public Library board, said that the bookmobile is back on the road, after extensive repairs were accomplished with the help of Buttons’ Garage. Four new tires have been acquired as well; but two more will be needed before long. Farber and the other library board delegate, council member Kate Kysor, said that library users in the outlying areas have really missed the bookmobile while it was out of service. There have been some contributions from users recently, to help make sure the library outreach service could resume and then continue with its mission. The bookmobile serves Eldred Borough, and Eldred, Otto and Annin townships. Liberty Township is served primarily through the library building. Farber said the bookmobile service is heavily used, not only in the summer when school is out, but year round. Farber said the annual library dinner auction will be held on September 17. The theme will be “Happy Days,” a look back at the 1950s and 1960s. It was announced that borough crew’s union, Local 1319 of the International Brotherhood of Electrical Workers, has requested that negotiations be commenced for “improvements in wages, fringe benefits, working conditions.” The union represents non-professional borough workers, but not office staff or police officers. The council’s “first Monday” meeting time is also the regular time for a test of the siren system, which is supposed to alert the community of an imminent disaster situation or risk. When the five-minute, steady warning signal did not occur, Kallenborn phoned the 911 emergency center and was told, “We have been very busy.” Thereafter the siren was activated for the usual test, bringing council proceedings to a halt for the duration. Graduation 2011 - The newest PAHS alumni are pictured as they celebrate outside the school following commencement exercises held Sunday afternoon. More photos from Graduation 2011 will appear on this week's picture page. Top Students Speak - Four students from the Port Allegany Class of 2011 gave the Commencement Address Sunday afternoon at the school. The theme of the talks were "T-I-M-E". Carli Johnston spoke of Traveling through our school memories. She also, as class president, gave the Welcome Address. Imagination for the future was the topic of Brock Bricker's speech. What Motivates you? was presented by Kenneth Kysor and the Pursuit of Excellence by Bryanna Evens. Speakers were introduced by High School Principal Marc Budd. Bricker began with Imagination for the future - "It seems like yesterday that we were finishing our first year of school. Who could have imagined what each and every one of us would grow up to be? Not even our parents could fully envision who we would be today. They could only hope we would fulfill our potential. I personally think every person on this stage has grown into a mature, young adult. However, in the end, how important is my opinion? It’s what “you” think that matters. It is more important than what your peers, teachers, coaches, family members, or anybody else thinks. The most important thing is whether you are happy and content with your accomplishments. As we prepare to move on to our next stage in life—college, military, entering the work force, or whatever that next step may be, no one should tell us what we can and cannot be in life. Imagine the future that awaits this class, it is endless. The potential is limitless. If we believe in ourselves, and act upon these dreams, no one can hold us back. Some may say this is just a cliché, but with this class I truly believe it. We all have very vivid imaginations and it’s even a little unnerving trying to imagine where the future will take us. It is true today, that we think we will remain close friends forever but with each reunion we attend less and less of us will make an appearance, and naturally we will grow apart. However, we will always carry the memories from elementary and high school with us, the good and the bad, the funny and the sad. Nobody can take those memories away from us. As our social connections change, so will our life goals. Those of us who feel very confident in the college they are attending, or the career they may want, could easily find themselves in a much better situation than what they can imagine today. It is that part deep inside of us that will determine our future. In summary attempting to imagine where each and every one of us will go in life or who we will become is nearly impossible. But regardless of how exciting, successful or rewarding one’s life can be imagined by others, in the end, it is what we imagine for ourselves that truly matters. Remember, a successful life is what YOU imagine it to be." Following Bricker, was Kysor who offered the following, " What motivates you? Perhaps it’s the idea of moving on to something greater in life? Or it may be the realization that for some, graduation is the first day of the rest of their life. Regardless of what motivates you, it is essential that each one of us is motivated by something. All through high school, I was motivated by the thought of being accepted to a highly regarded university and then eventually to a medical school. This ultimate goal motivated me to achieve the best grades possible and develop a strong work ethic. With the support of teachers, family, and my peers, I was able to attain excellent grades and develop a strong desire to learn. All of the students on this stage today have also been motivated to achieve something that is important to them. For some it may be acceptance to a 4 year university, for others it may be a trade school they wish to attend. Becoming a service-person in the United States Armed Forces may be the motivating factor that drove them to accomplish specific tasks in their education. Others may be motivated to join the many hardworking American citizens that are part of today’s workforce. Any single factor that motivates an individual is an essential and integral part of what makes that person a unique individual. Everyone has their own motivation, and it is up to that individual to define a specific idea, goal, or reason and make it their own. Motivation is what drives someone to achieve continued success. So as I stand here today, I wish my classmates continued success in each of their educational pathways be it college, trade school, the military, or the workforce. Life is a continuous learning experience and it is up to you to find motivation to reach your ultimate goal and fulfill the potential that each of you possess. I wish you the best of luck in reaching your full potential and in all of your future endeavors." Think about excellence in “your” life. · Do you have a positive habit? · Are you good at it? · Do you EXCEL at it? Maybe you practiced every night shooting the basketball, made 8 of 10 foul shots consistently and was your high school basketball MVP. Maybe you have a gift of friendliness, offering encouragement and strength, making everyone feel loved and comfortable in your presence. Maybe you are a mother or father that reads a book to their child each night, takes them to summer library and later that same child becomes a reading teacher. Or you might be that family practitioner that listens to their patients, keeps up on the newest treatments and prescribes the medicine that prolongs the life of your cancer patient. My excellence is my health. As many of you may know, I am a Type One Juvenile Diabetic and need insulin injections to survive. · Do I repeatedly give myself insulin when I eat carbohydrates? Yes I do. After I eat, I immediately need to manually give myself insulin. · Is this a habit? It sure is,it is a lifestyle that is part of me. · Do I excel in keeping myself healthy?Yes, because I have a plan and a goal in mind which is living a long, fulfilling life. · Do I see a glimpse of Excellence? Of course, I am alive and standing here! Excellence is different for everyone, but I believe there are common characteristics that help us reach excellence. 1. Believing– Knowing that you can make a difference and you hold the tools to your own glimpse of personal excellence. You have it within yourself to change your corner of the world. We all have gifts that we just need to recognize and share. 2. Drive – Do you want it? Can you taste it? Drive is all the sweat and not much glory! You push yourself beyond the limits and nobody, except you, knows how hard you tried. 3. Adaptability –Always be willing to change for the common good. Sometimes you may have to say, “I don’t know, but I will help you find the answer”. Arm yourself with other strong, talented individuals so you can prosper from their strengths and ask for help when you are weak. Teamwork is essential. 4. Passion – Do you feel it in your heart? In my heart, I have a passion to help other diabetic children feel like they are not alone and help them live a normal, healthy life. This passion has made me decide to specialize in helping other Juvenile Diabetics. This career will enable me to reach out, help and touch the lives of others. I would like to leave you with the idea that the true beauty of Excellence is the diversity of it. What is excellence to one person may not be to another. What touches you and helps you may not help your neighbor, but you need to be the true person that God has intended you to be. Know your strengths, make them a habit, and excel. Go out into the world and do what you do best." Johnston gave the final speech, Traveling through our school memories, saying, "Life is a journey made from a series of memories. Our school journey began on the exciting first day of kindergarten. Looking back on this journey, we remember all the crayons shared, snowy days on the playground, and of course traveling far away for field trips. What seemed like a long journey then now seems very short. The time through elementary school seemed to fly by and we were suddenly on the next leg of our journey. The first day of high school is frightening and nerve wracking. We will probably all remember the butterflies we felt walking into a new school, fear of the upperclassmen, and of course getting lost multiple times throughout the day. What seemed like a huge feat of bravery then doesn’t seem too frightening or nerve wracking anymore. The time through high school seemed to fly by and we are now standing at a cross roads for the next leg of our journey. Although some of us may be traveling far away, we will keep our memories of Port High close. Just as in middle school, along this journey of memories we may get lost, but we always have a home to return to, here. Just as in kindergarten, sometimes what may seem like a long time or a long distance is actually very short. Chances are you won’t remember every word of my speech. You may not even remember the topic, but you will remember the graduation parties, the family members who are here to support you, and all the hard work it took to reach this place. You will remember everything you did, everything you felt, and everything you achieved from the end of this part of your journey to the beginning of the new road before you. May you always hold the memories of Port Allegany dear as you make new memories in your future and take the time to remember those who have helped you along this journey of life. I encourage you to continue learning. Seek out opportunities to continue your education, and take the time to learn from your past mistakes. As quoted from Ferris Bueller’s Day Off, “Life moves pretty fast. If you don’t stop and look around once in a while, you could miss it”. So now I challenge you to make new memories but don’t forget to travel through the old ones in your journey of life." Presentation of the graduating class was done by Mr. Budd. Superintendent of Schools, Tony Flint, awarded diplomas. The 2011 Graduating Class included Nicole Jean Andrus, Franklin Perry Austin, John-Michael R. Austin, Jorden Melissa Austin, Ashley Lynn Bandish, Tiffany Marie Barber, Chad Vincent Barnard, Benn F. Baxter, Ashley Marie Bernardi, Todd Allen Bigley, Marcus Allen Borowsky, Cora Ruth Bova, Cody Kenneth Bowser, Brock Harry Bricker, Sarah Anne Brodhun, Brian Allen Carr, Cole J. Caulkins, Kenneth P. Causer, Julia A. Collver, Denna Jean Copenhaver, Robert Tyler Cornelius, Heather E. Crowley, Renee Larissa Edgell, Bryanna Elizabeth Evens, Amber Rose Fischer, Breanna Lynn Foster, Mathew Bryan Fryer, Crystal Lynn Genaux, Alexis Ann Goodrich, Travis Ryan Green, Laura Anne Haggard, Colleen Aiden Hardes, Carl Michael Haring, Jr., Caryne Elizabeth Healy, Kyle Aaron Hildebrandt, Kellie J. Hinchey, Ralph Emerson Hoffman, Jr., Kyle Dimitry Trotsenko Hunt, Dave J. Hurd, Carli Marie Johnston, Milez C. Kelly, Garrett S. Kio, Ryan T. Kio, Tammy Lea Knauer, Kenneth Jon Kysor, Bryan M. Lacher, Scott Michael Larson, Stacie L. Lentz, Jackie Rae Lewis, Nicole D. Lovell, Seth Thomas Lowery, Zachariah David Kahualualani Manning, Haleigh R. McClelland, Anna Maria McJunking, Ryan M. Michelitsch, Kyley Jo Mickle, Maxim A. Morris, Shane M. Mullen, Karissa Anne Neal, Ryan J. Orner, Benjamin Wayne Osani, Luther James Perkins, Shagahra Zachary Ramadhan, Mark Robert Rees, Brittany Lynn Reinard, Dana Reynolds, Brittni Kay Saltsman, Cody Jonathan James Saltsman, Adrian A. Schroll, Justin Michael Schultz, Samuel R. Shaffer, Alesha S. Shatley, Tyler J. Smith, Camrin J. Stuckey, Chelsea Louise Surra, Jennifer Michelle Swick, Chester John Tanner IV, Kody K. Taylor, Derek Scot Terwilliger, Caleb A. Turner, Lucas Temple Turner, Daltson B. Warnick, Rickylee Warnick, Shane A. Whitney and Amber A. Yentzer. Music for the ceremony was provided by the Junior/Senior High School Concert Band under the direction of Brad Stewart. Refreshments were served by Tracy, Vicky and Kaylee Kio and were provided by the Port Allegany Youth Counselors. SAL Donates - Sons of the American Legion presented a check for $652, the proceeds of their recent Cookout Raffle and Chicken and Biscuit Dinner to Healing Waters. Pictured are Gene Johnson, David Saulter, Dr. Pete Ryan, President of God's Country Chapter of Trout Unlimited, Wayne Thomas, Commander, Sons of the American Legion, Roy Kio, Treasurer, Sons of the American Legion, Dave Hobbs, Adjutant, Wade Elliott, Brian Bell and Scott Hobbs. SAL Helps Healing Waters - The Sons of the American Legion presented a donation to representatives from Healing Waters during their regular monthly meeting. Accepting the donation were Dr. Pete Ryan, President of the God's Country Chapter of Trout Unlimited and Dave Salter. A fly fishing adventure for disabled Veterans and Active Duty military personnel were guests for three days in Potter County. The guests learned skills of fly fishing and fly tying. Events like these have been shown to be beneficial to both the physical and emotional rehabilitation for our Veterans. For further information, go to www.projecthealingwaters.org. Not so long ago a visit to 6 North Main Street involved getting a haircut. The former proprietor and his customers would not know the place now. Last Thursday the storefront at that address was abuzz with activity. Visitors found that it had been transformed from the pleasant but low key barbershop interior to a bright, light space. This is the new teen center for secondary school age youth. Clearly, it was designed for fun and socializing. The place has new vinyl tile flooring, with carpet in one corner, where there is a big couch. The focal point there is a large TV screen, along with a game system. Along one long wall there are desks topped with keyboards, mouses and monitors, flanked by desktop computers. One bears a sign saying that the computers are not for social networking. All surfaces have had a makeover. The ceiling has a full array of surface-mounted fluorescent fixtures. Those and the sunny colors of the floor and walls make the place seem cheerful and bright. The teen center is a project of SWAMP, which is an acronym for Success With Achievement, Motivation and Preparedness. In turn, SWAMP was developed initially through a grant-supported program, Challenge and Change, in which three local Girl Scout Troop 22116 members received training in developing meaningful programs and serving their communities. More recently, other youth have become active in planning and preparations. 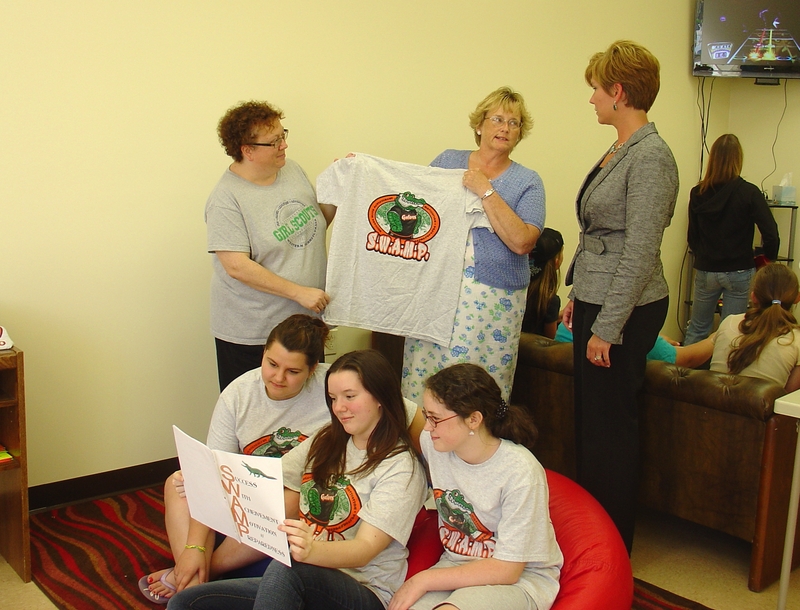 As the goal of establishing a teen center took form, a major sticking point was the need for an affordable location. Then key support came from the McKean County Redevelopment Authority (whose other face is the McKean County Housing Authority). The authority had acquired the building at 6 North Main Street after the barber retired and the barbershop was vacated. At one time the authority had planned to renovate the space for use by an education program. The program changed its plans, and the space became available for other use. Among entities that have helped SWAMP and been supportive of the teen center, organizers list the Redevelopment/Housing Authority, the Moose Family Center, Port Allegany Junior-Senior High School, the local Fox’s Pizza and Jubilee and Sheetz stores, Port Freeze, Team Minard Productions, Olean Copy Connection, MBS Temporary Services, Smethport Electronics, and Moneysaver. The authority is covering utilities costs, for now. SWAMP has done some fundraising and plans to do more, has held one dance (at the Moose), and has tee-shirts and other items for sale. Rev. Mr. Randall Headley of the Port Allegany United Methodist Church presided at the dedication of the center at 7 p.m.
For more information, e-mail tc.swamp@yahoo.com. Charles Cole Memorial Hospital’s Coudersport Wellness Center recently received two bikes, helmets and snowshoes with poles through the University of Pittsburgh at Bradford’s Center for Rural Health Practice. The equipment can be rented free of charge by community members and was purchased with funds from the Get Active grant as part of the Governor’s Council on Physical Fitness to promote an active lifestyle, according to Claudia Caminite, Get Active project coordinator at UPB’s Center for Rural Health Practice. Equipment is also available at the Bradford YMCA and Costa’s Ace Hardware store in Smethport. Caminite noted the equipment is to be used in conjunction with other forms of exercise such as walking, jogging, or running with the goal to reduce chronic disease and promote healthy physical activity. To utilize the equipment, residents must complete a rental application form at any of the locations; some restrictions apply. For more information on the program, contact Caminite at clc209@pitt.edu. From left, Claudia Caminite, Get Active project coordinator at the University of Pittsburgh at Bradford; Theresa Long, Coudersport Wellness Center manager; and Brenda Brandon of UPB’s Center for Rural Health Practice display bikes and snowshoes that were donated to the Wellness Center.